Sorcerer of Siva was supposed to be a quick detour--a kind of coda to my recent coverage of Keys of Acheron. I was so sure I'd finish it within a couple of hours that I originally planned to slot this entry, which I thought would be short, as a "bonus" between two regular ones. The game ended up taking most of an entire Sunday, and when I was done my desk was covered with scribbles and maps. "This was not the MicroQuest I was promised!" I wanted to scream. 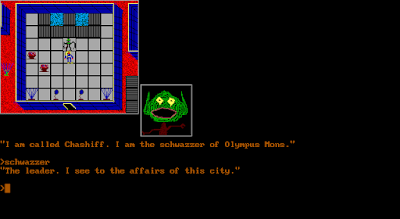 But therein lay the problem: Epyx never said that Siva was a "MicroQuest," the label it used for two early Dunjonquest spinoffs: Morloc's Tower (1979) and The Datestones of Ryn (1979). When I played them in 2013, Morloc's Tower took less than an hour, and Ryn was time-limited by design to 20 minutes. Siva is within that tradition--a standalone title with a fixed character, limited RPG mechanics, a short duration, no ability to save, and a final score that encourages replay. But it's much longer and much harder than its predecessors, such that it pushes the boundaries of decency when it comes to its lack of a save capability. In a typical Sorcerer of Siva screen, I'm standing in the center of a room with a wolf nearby. A bit of treasure (a ring) is waiting for me after I defeat him. This game is unique in the Dunjonquest series in that different types of treasure have different icons. The two 1979 titles, featuring a hero named Brian Hammerhand, was at least given attributes and items (although since they were unchangeable, they were constants, not variables), but the magic-using hero of Siva doesn't even have a name. What he does have, for the first and only time in the Dunjonquest series, are spells: "Open," "Heal," "Fireball," "Reveal Distance to Stairway," "Jump," "Bolt of Lightning," and "Teleport," each mapped to a different key (usually the first letter). 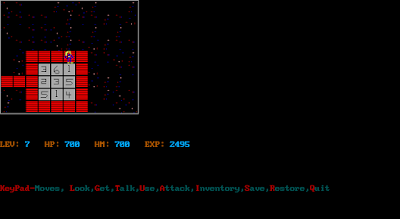 The player starts with a number of spells from 0 to 7 depending on the chosen difficulty level. Actually casting the spells depletes an "aura" bar that recharges slowly. Spells can be forgotten but remembered (or discovered for the first time) by finding "touchstones" throughout the dungeon. You find them in a fixed order, so if you have only one spell, it's always "Open"; if you have two, it's always "Open" and "Heal"; and so on through the list above and ending with "Teleport." 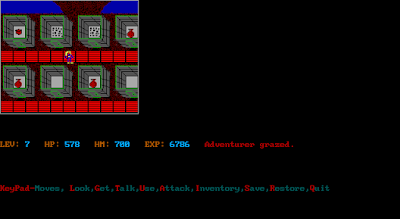 The other commands, including "L," "R," and "V" to move and turn, using the number keys to move forward a number of steps, "A" for attack, and so forth remain the same as previous Dunjonquest entries. 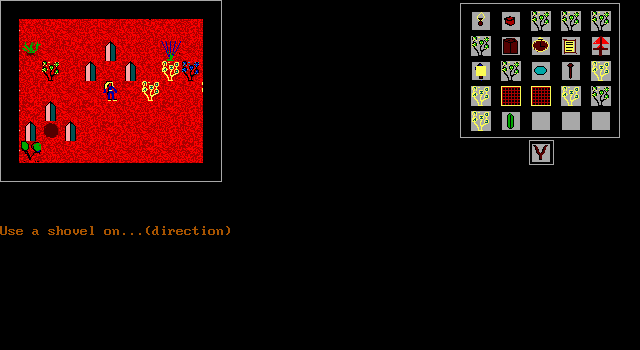 "Y" has you drink a healing elixir if you've found any; "E" examines the wall for secret doors; "S" searches for traps. The setup is that the character is stuck in the Mines of Siva, pursued by the minions of the infamous Sorcerer of Siva, and must escape. Escape is on the fifth level of the mines, and the character must find the exit within 4 game hours or the door will shut for the night, and "nothing human can survive a night in the Mines of Siva." Along the way, you pick up treasures and kill monsters to increase your final score, and you can even kill the Sorcerer himself. The game begins on Level 1 of 5. The large dungeon has more than 300 rooms, and of course you don't try to explore them all each game. You can even get sent below Level 1, to a shifting "Underworld" full of monsters, where you have to struggle to escape to the regular difficulty of the Mines. The game invites you to set both a skill level and a "speed factor" at the beginning of the session, encouraging you to play for the first time on Level 1, which starts you with 7 spell slots and always starts you in the same location. Higher skill levels randomize your starting location and lower the number of starting spells. The speed factor adjusts the real-time length of a turn, and thus the speed at which the clock counts down. Functionally, a high speed factor means that you end up "passing" a lot of turns unless you're prepared to act quickly. The ultimate challenge is to win the game at skill level 8 and speed factor 10. The only options before beginning the game. It's pretty hard even on Level 1. A turn lasts about 6 seconds, and there are 5 turns per game minute, meaning you have about 2 hours to escape the dungeon. Monsters appear relentlessly as you stand around--vampire bats, demons, giant spiders, ghouls, goblins, skeletons, trolls, and elementals among them--and blasting them with your spells drains your aura quite fast. Even worse is the fatigue meter, which goes from "Fresh" to "Exhausted" (at which point you can't do anything) in the space of about a room and a half. Attempting to stand still and rest to restore both meters tends to just encourage more monsters to appear. It's very easy to get into a cycle of exhaustion that you can't get out of. The dungeon is huge, each level containing a maze of 64 rooms in an 8 x 8 configuration (except Level 2, which for some reason uses 16 x 4). 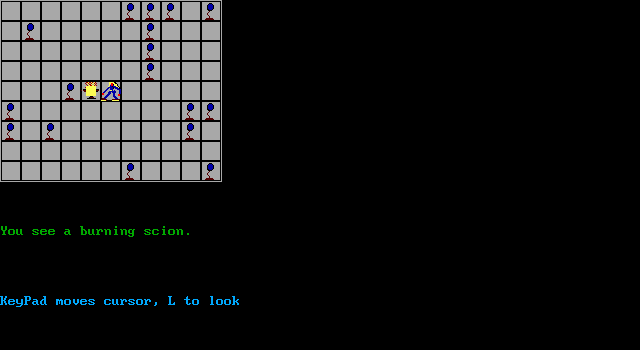 Although there are theoretically multiple staircases upwards, they tend to be clustered in one part of the dungeon. Finding one could take hours; in my first attempt, I was on Level 1 for 2.5 game hours (about 1.25 real hours). If you don't start with all the spells, touchstones are extremely rare. You could easily make it to Level 5 without finding more than two or three. A decent portion of valid paths are blocked by secret doors, which take multiple rounds to identify and may take multiple castings of "Open" to allow passage. Monsters tend to spawn while you're searching. The south wall has a secret door. It will take multiple castings of "Open" to open it. You can fight monsters with your dagger in melee range, but that's a last resort. Injuries make spell and fatigue restoration last much longer, and it's easy to get into a inescapable downward spiral if your health drops too low. "Bolt of Lightning" usually kills monsters in one hit; "Fireball" does the same for some of the lesser monsters. I blast a "Fireball" at an ogre. 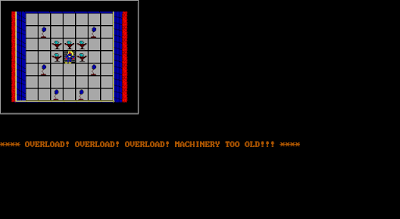 The worst part of the game is the existence of trap doors, which spawn randomly in corridors. You can often only avoid them with the "Jumping" or "Teleportation" spells, or by turning around and finding another path. If you fall into one, you end up in the "Underworld," below Level 1, and you have to find your way back to the place that you started. There's really no point in continuing the game when this happens, since it leaves you in a worse position than when you started. Another menace is the titular Sorcerer, who can show up in any room on any level. But he's a coward, and he only appears if you're already fighting another monster. He sits in the background and makes you forget spells every round, so that you need to find touchstones to remember them. Because he always pops up behind the monsters you're fighting, you can't target him directly--and he's only vulnerable to "Bolt of Lightning" in any case. My plans for a quick game thus collapsed when I found myself unable to progress without cheating with save states, and even then I was unable to get out of the dungeon in the time limit on my first try. Resisting the temptation to abandon it completely for a Star Control II session, I girded myself with soda and Cape Cod chips, warned Irene she wouldn't be seeing me for a while, and settled in for a long period of testing and mapping. The box quite notably says "MicroQuest" nowhere. A few strategies came to light, most of which Redhighlander had already discovered. You almost never want to just walk through a room. That leaves you vulnerable to monsters appearing in front of you and trap doors. The "Teleportation" spell, which moves you one room in the direction you're facing, is a godsend. It takes almost all of your spell points, but sometimes casting it and replenishing is faster than walking through a room, fighting a combat or two on the way, and having to wait for your fatigue to replenish anyway. If you're unable to teleport a particular direction, you know you're at the edge of the map. "Locating a Staircase" is also helpful, but it only tells you the distance, not the direction. You basically have to triangulate with it. "Jump" can get you through a room in two castings and is thus often as useful as "Teleportation." Monsters chase you to the edges of rooms but they never leave their rooms. And when you leave and re-enter, they're always in the center. So if you need to rest up, you can straddle the door between two rooms, resting for a couple of rounds in each one and exiting just as the monster approaches you. Another strategy is to find a room where a secret door blocks you from the room's center. Since enemies only spawn in the center, these are free rest places. As for the sorcerer, I found a decent strategy for dealing with him. You have to be on guard, but the moment he appears, you have to hit "9" to run past the monster you're fighting so there's nothing in between you and the sorcerer. Then you can blast him with "Bolt of Lightning." He usually managed to drain one of my spells ("Teleportation" is always the first to go) even when this worked, but it's worth it because once the sorcerer is dead, most of the high-level enemies like demons and efreet stop appearing. Here's a shot of me killing the sorcerer. It looks like the zombie is in between us, but I think I jumped past him and the screen just hasn't refreshed yet. Most important to my success, however, was my map. The dungeon has a fixed layout, including the position of secret doors. Treasure locations are randomized, but staircases remain in the same position. I didn't map the entirety of every level, but I mapped enough to find the way to the up staircases on each level. My mostly-completed map of Level 4. The alternating shaded/non-shaded areas are the game's "rooms." With these strategies and resources, I was able to get a new character out of the dungeon in a little over 3 hours on Level 1. Higher levels mean starting with fewer spells. At Level 2, you don't have "Teleportation" until you find a touchstone. At Level 4, you don't have "Jumping" and thus have to walk everywhere. 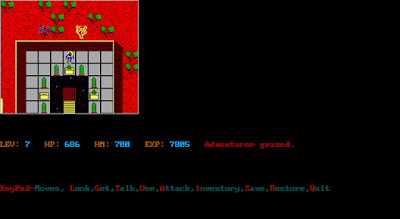 (You functionally cannot outrun creatures unless you enter the room with no fatigue. Even then, you might find that you're unable to move the last two or three steps to the exit while the creature closes in on you.) At Level 8, you have no spells whatsoever. I can't see beating the game at Level 5 or above unless you're extremely lucky with the positioning of touchstones and trap doors. I tried it a few times, but I kept getting killed by enemies quickly or tossed down to the Underworld. I accomplished nothing and still got 498 points. I should also mention that I played the game at 250% emulator speed. Playing at era-accurate speeds redefines "excruciating." I wouldn't give it to someone on death row. 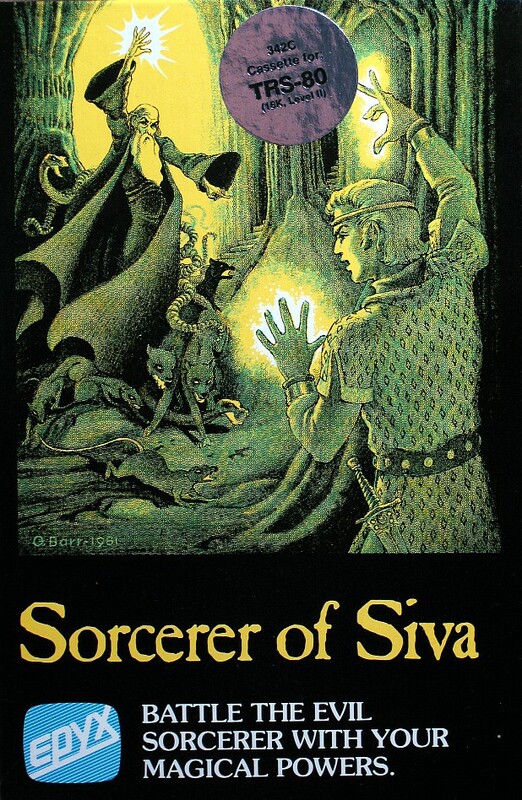 Sorcerer of Siva isn't really an RPG by my definitions, lacking any character development, inventory, or stats-based combat. It thus performs pretty miserably on the GIMLET, earning only 11 points (2 points each for game world, magic and combat, interface, quests, and gameplay, plus one for encounters). This is the lowest total yet for a Dunjonquest game; I just gave Acheron a 24 two days ago. But if nothing else, it shows how the same engine can be used for extremely different types of games. This one wasn't for me. This is my third attempt to play a title from the German developer Motelsoft, which cranked out at least 23 mostly-forgotten RPGs (as well as lots of non-RPG titles) between 1988 and 2003. A partnership between two developers, Harald Breitmeier and Heinz Munter, Motelsoft favored the Atari ST for their first 7 years but ultimately switched to DOS and then Windows. To call their games "obscure" is almost an understatement: Of the few sites that carry any information about Dark Stone Ritual, almost all of them have overlooked the fact that the main title of the game is Magic Tower I. But Motelsoft made up for notability with quantity. Based on the information on their web site, just two programmers produced between 5 and 12 games per year for almost two decades. If they borrowed many of their elements from other games, the speed and skill with which they did so is still impressive. A subtitle screen supplies what most sites think of as the main title. My first attempt at a Motelsoft title, 1988's Seven Horror's, went okay, but without documentation I never really knew what I was doing. The main party was composed of monsters, with weirdly-named character races like "hunches" and "megrims." The goal seemed to be the collection of seven artifacts from various dungeons, which I did, but I still couldn't figure out how to win. It just occurred to me that the game ought to go on the "Missing and Mysteries" list. My attempts to play Sandor (1989) were also hurt by a lack of documentation, plus the fact that I only seemed to have an evaluation copy. 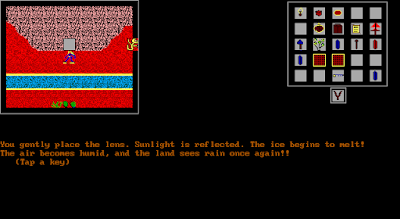 The game was a little more developed as an RPG and seemed to draw inspiration from SSI titles, particularly Demon's Winter (1988). I never found any obvious source for Seven Horror's. 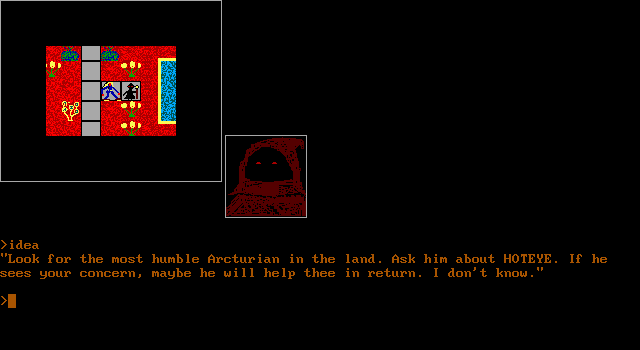 It was thus without much expectation that I fired up Dark Stone Ritual and almost immediately found myself intrigued. 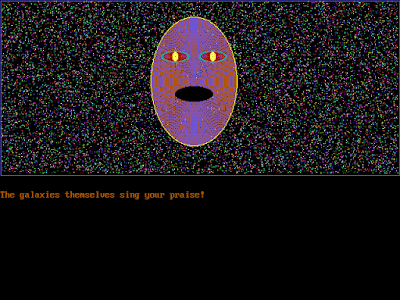 To start, the creators had clearly been exposed to Might and Magic III (1991), which means they had to program Dark Stone Ritual quite fast. Not only have they replaced the attributes of the previous titles with the standard Might and Magic set (might, intelligence, personality, endurance, speed, accuracy, and luck), not even bothering to translate their abbreviations to German, but they've done a decent job mimicking the Might and Magic III character and inventory interfaces. Not only did they do this visually, such as the separation of equipment into different categories, but many of the mechanics also work the same way; for instance, clicking on an item in one character's inventory and then clicking on a different character will transfer the item. The character screen. Note the odd mix of German text and English abbreviations. 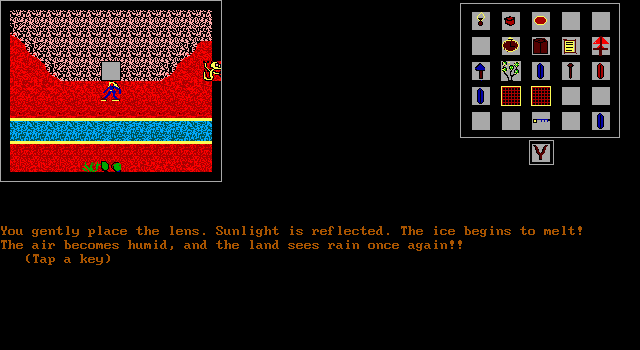 The outdoor interface remains top-down like the previous Motelsoft titles, but it's very in keeping with the Might and Magic III experience. The world is tiled, with little huts and caves dotting the landscape, most offering a textual encounter with an NPC. There are forest and mountain squares you can't navigate until you have the appropriate skill. 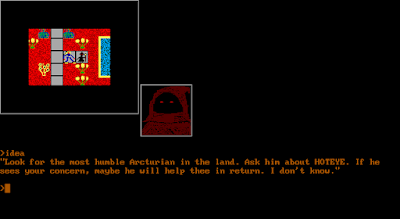 Once you enter a dungeon, castle, or other indoor area, the game switches to a first-person view that at first reminds you more of Dungeon Master than Might and Magic III, particularly with its navigation arrows and the switches to open doors. But the nature of the encounters within the dungeon are more in keeping with the Might and Magic tradition. The question mark is akin to the "countertops" that Might and Magic III used to signify encounters in towns. Combat goes its own way, slightly. The developers unfortunately didn't have the ability to show monsters in the environment, so combats pop up randomly as you explore, more like Might and Magic II than III. 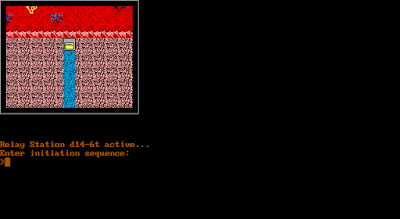 You get two combat options: schnell ("fast") and strategie ("strategy"). 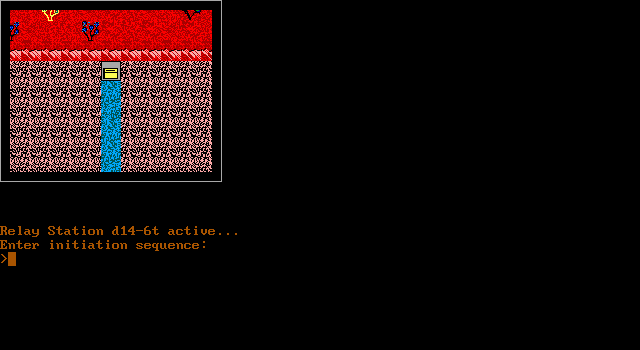 Fast combat plays a lot like Might and Magic III, just on a different screen. Each character acts in turn, attacking, parrying, using an item, or casting a spell, and the actions execute immediately like in the Might and Magic series (and unlike the Wizardry and Bard's Tale series, where they line up and then execute together). You cannot specify a particular enemy in this method. The strategic method offers the same options, but on a gridded map, where you can position your characters around specific enemies. It takes longer because you have to move and specify facing directions, but it's a better way to fine-tune your combat and prioritize specific foes. Strategic combat. The compass is appreciated. This is all a huge step up from Seven Horror's and Sandor (in between, I haven't played 1991's Projekt Terra or Sandor II yet), and it has the makings of an authentically fun game. I'm still figuring out quite a bit. In addition to being in German, which requires a translation pause on many screens, there appears to be no extant manual, and I have no idea what the main quest is. I'm particularly keen to see how the spells develop. The cleric starts with just "Close Wounds" and the mage starts with just "Identify Monsters" and something called "Single-Shield." Other classes have spell points, suggesting they will eventually get spells. The game requires gems for some spells, again borrowing from Might and Magic. Starting out with a new game. Unfortunately, there are a few underdeveloped areas. The game seems to have no character creation process. It just starts you with a paladin named Monky, a knight named Sirus, a thief named Ellie, a priest named Knorr, and a sorcerer named Laura. (The classes have also changed to Might and Magic standards, though not all of them.) "Monky" and "Knorr" were also default character names in Seven Horror's. If there's any way to dump the default party and create your own, I haven't found it yet. But perhaps the worst part of the game is that absolutely nothing is accomplished with the keyboard. You have to click around with the mouse to do anything. 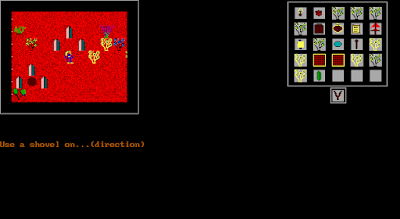 The party starts on an overland map with a few visible structures. The closest, a hut to the west, a guy named Kalak offers to sell grundausstattung ("basic equipment") to the party for 2,500 of its 12,000 starting gold pieces. This automatically equips each character with a kleines messer (small knife), a cap, a frock, sandals, and a wooden shield. This is a nice shortcut, though I would have still preferred a full equipment shop. That guy doesn't look like he knows much about adventuring. Nearby, entering a cave brings up a screen that challenges me to press four buttons in the correct order. No matter what I do, I find myself in a dungeon. A large castle-looking building to the south also has a dungeon. Southeast of that is a tent where "Mira the Ranger" offers to teach me "Forestry" for 15,000 gold pieces. Either that or the "Mountaineer" skill is going to be necessary to progress very far, because in almost any direction there are objects that tell me I need those skills at a particular level to move on. In another hut, a guy is selling "information about Umure" for 200 gold pieces. I say yes the first time, and he tells me that there are 9 "marauding groups" lurking in the city, and that I should come back when I've "done it." Notice the player's only reaction to not having enough skill. Combats and treasures show up as you explore wilderness squares. So far, I've determined that the game has a skill system that determines what items you're able to wield and wear, but not much more than that. There's a food system and a rest system. Clicking other buttons brings up screens that suggest that someone with "Clairvoyance" skill can get an automap of the area. There's a button that seems to automatically take the party to the exit of the dungeon if they're deep into it, and another that allows you to wait in ambush for enemy parties. I haven't yet explored the nuances of any of these things. I did finally find a weapon shop. I leave you exploring Umure, which seems to be more a city than a dungeon. 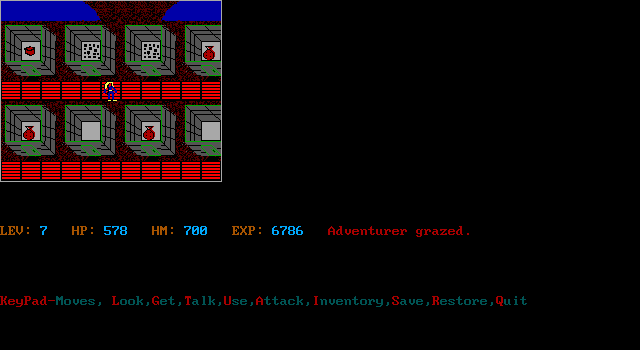 It has some marauding enemies, yes, but also a proper equipment shop, a tavern, a temple, and a training facility, again much like a Might and Magic town. The tavern gives me the ability to sleep, eat, drink, and buy food, but not create new characters. I haven't made a lot of progress, but I think I'll leave things here for the opening entry. My readers have a way of turning up documentation that I can't find. Motelsoft may have "borrowed" a lot for this one, but so what? It looks like the result is going to be fun. The aptly-named "Orz" do indeed make me want to kneel down and bang my head against the floor. 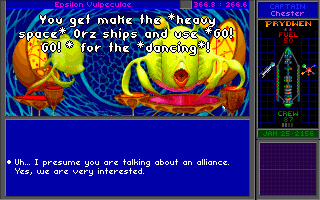 If I do end up running out of time and having to start over with Star Control II, at least I'll get to revise my decision to name my new alliance "The New Alliance of Free Stars." I didn't realize I'd be giving that name to everyone I meet. Next time, I'm going with "The Empire of Chester." The Empire is growing. In contrast to my last session, where I didn't seem to make much progress, I did nothing but accomplish things this time around. It began with a slight rewind. 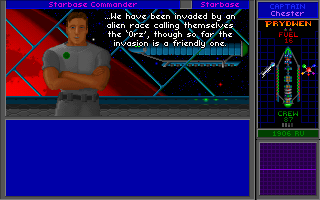 After I reloaded from my fatal (for him) encounter with the Shifoxti rogue ship, I was back at starbase. 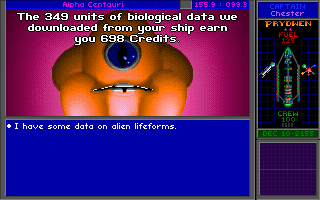 I returned to Delta Gorno, but by way of the Melnorme ship at Alpha Centauri, where I sold a heap of biological data and now had enough credits to actually start buying things. No rainbow worlds yet, though. In addition to the Shofixti warrior I'd already met, there's another solo warrior out there plus several females in the menagerie of the Vux admiral Zex. If I can bring the females to the two males and things work out, there will be millions of new Shofixti within a few human generations. The Melnorme recommended that we adopt an approach of insulting the Shofixti and then fleeing if attacked. 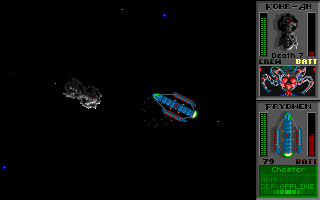 The Ur-Quan are presently at war with a race called the Kohr-Ah, which are not the alien probes, so I was wrong there. The major fighting is in the middle of the galaxy. The Kohr-Ah seem to be winning. Their war has caught the Zoq-Fot-Pik in the crossfire (something I'd already heard from that race). The Ur-Quan are part of an ancient alliance of races called the "sentient milieu." The blobbish Umgah, one of the races in the Ur-Quan hierarchy, renowned for their sense of humor, has begun screwing with the Ilwrath (the spider-like creatures) by using a device called a HyperWave Caster to impersonate the Ilwrath gods, Dogar and Kazon. When the Ilwrath priest caste decried this fakery, the rest of the Ilwrath population slaughtered the priests. If we could get our hands on this Caster, we could effectively neutralize the Ilwrath. I ran out of credits at this point, but I'd added a few new items to my "to do" list. 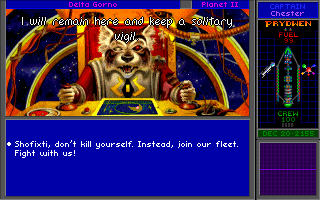 On we went back to Delta Gorno, where I ran into Tanaka the Shofixti again and this time insulted him. When he attacked, I fled. I re-engaged him almost immediately and noted that I had different insults among the dialogue options, so I figured I must be getting somewhere. He attacked again; I fled again. I think on the third attempt, he realized that the Ur-Quan had never insulted him before, and thus slowed down enough to figure out that we were his allies. Although glad to hear of a new alliance against the Ur-Quan, he declined to join us, preferring to stay and guard his old system. I assume I need him there for when I bring back the Shofixti females. I'm going to try to get you some company. I find that altering your approach to quests makes a lot of modern games extremely replayable. I tend to play the first time using a "consequential/geographic proximity" combination, meaning I prioritize by importance but pick up side quests as they exist along the route. This ensures that I actually finish the main quest. I don't want to be one of those people that says things like, "I have 1,200 hours into Fallout 4 and I still haven't won the game." I go for the win the first time. The second time, if I'm motivated to play again, I might try a chronological approach to ensure that I explore more of the side quests. Lately, though, I've been prioritizing a random approach, such that Irene is sick of hearing me say, "Hey, Siri, give me a random number between one and twenty-five" before heading off to bag a Legendary Elk. With Star Control II, I've been using the random approach, mostly because none of the quests seemed obviously more important than the others. But by the end of this session, I had decided to revise my system and use a geographic proximity approach instead, mostly because I nearly ran out of fuel twice while in the fringes of space. Still using the random roll, I next chased rumors of an unknown ancient race who used to make their home in the Vulpeculae constellation, in the middle of Androsynth space. I didn't expect much from the expedition. Indeed, I figured I'd be attacked by Androsynth and that would be the end of it. 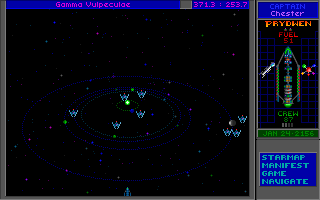 Sure enough, I arrived to a swarm of ships who immediately started approaching my own. Well, this doesn't bode well. Hello extremely! I hope you like to *play*. Some *campers* are not so good for *games*. . . Who are you? You are not Orz! We are Orz! Orz are happy *people energy* from the outside. Inside is good. So much good that the Orz will always *germinate. * Can you come together with Orz for *parties*? At first I thought something ribald was going on here, like "parties" meant "orgies" or something. But things didn't develop explicitly along those lines. The best I could work out from their many lines of only partly comprehensible dialogue is that the Orz come from another dimension, that the individual Orz we perceive are all just "fingers" of a single being (like a happy version of the Uhl from Starflight), and that they destroyed the Androsynth for some unknown reason. (They got mad when I even asked about it.) They also don't seem to like the Ariloualeelay, whom they suggest are from their dimension, but from "above" while the Orz are from "below." Let's just make sure we agree on a safe word. Anyway, they seemed to join the Alliance. They let me land on their planets, and they gave me specifications for an "Orz Nemesis" ship that I later had built. Good to know that the Androsynth aren't a threat anymore. On one of the planets--the second around Eta Vulpeculae--my scanners picked up energy signatures for the first time since (I think) Pluto. There were a lot of them--destroyed Androsynth cities, it turned out. As my lander explored these cities, the game again invented names and personalities for some of my interchangeable crewmember-hit points. Their reports together created a kind of mini horror story. It began with "xeno-historian Kilgore" reporting that some kind of land war destroyed the cities but left no corpses. Later, "science officer Bukowski" reported that the Androsynth had been researching "Dimensional Fatigue Phenomena," based on their discovery of some Precursor artifacts. 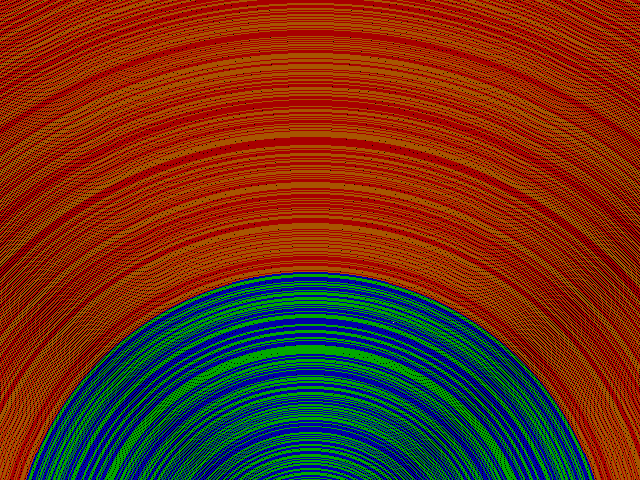 They were generating waves that allowed them to see into other dimensions. They ended up making contact with some life form on the "other side," after which their research degraded into rantings about ghosts and poltergeists before abruptly coming to an end. Multiple lander reports deliver a growing horror story. In continued reports from the lander, "Ensign Hawthorne" radioed that Bukowski had continued his inquiry into the Androsynth research project and had himself gone insane, ranting that "they" could now see him and that he had to stop "them" before "they" could see everyone else. Stigmata started appearing on his body, as if he was being cut by an invisible source. The crewmembers on the lander begged to be brought home, and running them into other cities didn't seem to generate any new reports, so I complied. Lots of mysteries here. Are "they" the Orz? The Ariloualeelay? Some other beings from another dimension? Just who have I allied with here? On another old ancient ruin, my crew found an "unusual glowing rock-thing" that seemed to make some people sick with headaches and "mental disarray." It was said to be Taalo in origin, this name appearing for the first time. I assume it's the name of the ancient race that lived in Precursor times. Adding the Nemesis to my fleet. Now I have four ships that I can't pilot effectively! For my last expedition, my random roll gave me the Zoq-Fot-Pik homeworld, which is in the middle of the map but the farthest I've traveled so far. I stopped at a few systems on the way to search for minerals and whatever else. I'm finding that I hate planets with a "weather" score higher than 2. I can usually avoid earthquakes, and thus deal with a high tectonics score, but lightning bolts often seem to target my lander specifically, and none of my dodging and weaving helps. 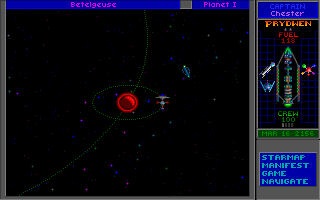 One of the worlds I stopped at randomly was Betelgeuse. There, I was surprised to find a red force field covering a planet and a starbase in orbit. It turned out to be Gaia, the new homeworld of the Syreen, their old one having been destroyed before the events of the first game. When the Alliance surrendered, the Syreen--like Earth--chose to live under a dome rather than serve as battle thralls. 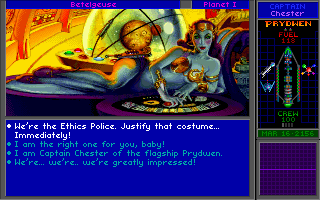 In a long conversation with the Syreen Commander Talana--in which the game seemed to delight in giving me boorish, inappropriate dialogue options--I learned quite a bit about the race. They used to live on Syra--which we call Beta Copernicus--before an asteroid impact caused such volcanic upheaval that the planet had to be abandoned. Now, the entire system seems to have been taken over by the Mycon. The game gives me one professional option and three takes on sexual harassment. When the Syreen surrendered to the Ur-Quan, they chose the shield but noted that they had no actual planet. The Ur-Quan asked them about their requirements. The Syreen talked about Syra ("about the color of its sky, about the abundant, varied lifeforms, about the fertility of the soil and seas"). The Ur-Quan took an hour, then communicated back with the coordinates of Gaia, which the Syreen found to be absolutely perfect. "We'd been searching for a home planet for seventy-five years," Talana said, "and in the end, it was our enemies who gave one to us." Naturally, they were now uninterested in violating their treaty and upsetting the status-quo unless I could give them a good reason, and I had nothing. But I put their old planet on my "to do" list for investigation. On to the Zoq-Fot-Pik system (ZFP from here on). When I arrived, I found it swarming with Ur-Quan, and before I could escape, one of the Ur-Quan dreadnoughts approached. Our dialogue just consisted of the Ur-Quan captain making threats. In the ensuing combat, I couldn't do anything. I tried about five times. The dreadnought fires huge metal swastikas or something--I think they're actually supposed to be autonomous ships--that fly around until they hit something. They have as many hit points as my own flagship. None of my smaller ships lasted more than a few hits and even with my flagship, it became clear that if I won, it would be with about 10 crewmembers left over. I really hope it's possible to win this game without being good at the space combat. I missed the shot of the enemy's projectile. It's just crashed into my cruiser. So I ultimately sighed and escaped combat, which leaves your ship immobile for about 10 seconds as it jumps to hyperspace, which is enough time for the enemy to destroy a couple dozen crewmembers. I dodged the rest of the Ur-Quan ships and made my way to the ZFP homeworld, where the faintly ridiculous species agreed to join my alliance. The Pik is the emotional one. I leave you on my way back to starbase. The trip to the ZFP system took so much fuel that I have to keep my eye on the gauge as I explore for elements. But I do have to explore because if I don't, I won't have any money to buy new fuel when I get back. Lots of fun and progress this trip, though I'm not sure what it's amounting to just yet. Congratulations! Here's a near-unreadable screen! Ultizurk II ended up comprising five outdoor maps, nine dungeon maps, and 5 "dream world" maps, all 64 x 64. This is far too big for a game of such limited playability. The maps exist in a mostly linear manner, which makes it a nightmare to go back and forth among the areas as you try to solve the various puzzles. Walking through the dungeons isn't hard, if you bring enough herbs, but it's long, particularly with the clunky interface and the need to stop and toss sling stones at monsters every five steps. Towards the end of the game, I just couldn't take it anymore, and I confess that I used a hex editor to figure out the character's saved coordinates and manipulate them to get him through the dungeons faster. The order of the game's maps. You'll note that all the areas are, indeed, named after features on Mars, although sometimes misspelled or otherwise a bit mangled. 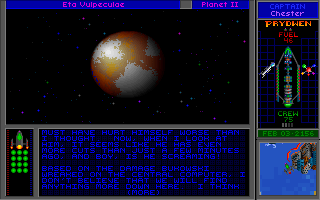 I was authoritatively not on Mars for this game, however, as the residents are always referred to as "Arcturians." In Arcturian, leaders are called "schwazzers." Got it. All of the dungeon maps were swarming with monsters. Most of the outdoor maps were, too, but a couple were monster-free. As promised by the manual, each of the cities outside the starting area had one or two NPCs. They all responded to NAME and JOB and then suggested keywords in their responses. Sometimes, the keywords were a bit unintuitive, such as when the leader of the planet says, "I see you are trying to help us, but alas!," and the next prompt is not HELP but ALAS. None of them had much to say in general, and the game missed an opportunity to better flesh out the game world with these dialogues. None of them had anything to say about any water crisis, and almost all of the maps had a fountain or two, suggesting no crisis at all. The Shadow Master had laid it out last time: my goal was to collect three crystals for each city's mind machine (five total machines), use the crystals to power the machines, enter the dream worlds, and collect an orb from each. The machines require specific crystals in a specific order; the ones a machine requires are usually found closest to that machine. What you don't want to do is wait until you have a bunch of crystals and then try to figure out what machine uses which ones and in which order. That takes forever and there's no way to solve it but trial and error. Another dream world puzzle had the player nonsensically meet Wyatt Earp, who was trying to figure out how to best apportion sacks of feed among his buffalo ranch. It was basically a magic square puzzle--the columns and rows had to add up to 10--except with repeating values for the sacks (1,1,2,3,3,4,5,5,6) and no requirement that the values add up to 10 on the diagonals. There are systems for solving magic squares with nonrepeating values, and you can even do it with algebra, but at the time I couldn't figure out a formula that would work with this nonstandard version. Eventually, I just solved it through trial and error. When I had all five orbs, I slogged all the way back to the starting area and placed them in their receptacles in the transportation room. Supposedly, I just had to mentally concentrate on where I wanted to go, and I'd go there. Instead, I got a message that said "Overload! Overload! Overload! 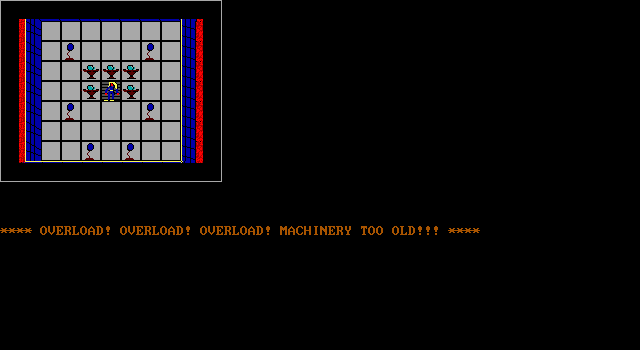 Machinery too old!" and the orbs all burst into flame. The Shadow Master had nothing to offer about this turn of events, but he did say that he'd dug up an obscure keyword (HOTEYE) that I should mention to the humblest person I had met. Well, I hadn't met any clearly humble people, but neither had I met so many people that I couldn't swing by all of them with message. The intended recipient turned out to be Krindell, an Arcturian in Hellas who I'd previously dismissed as a lunatic because he just went on about flowers and how they teach him of the heart. Krindell turned out to be the leader of the planet. The HOTEYE keyword led to a discussion of "the lens," a theoretical construct that would melt a glacier in Elysium Mons, thus "restoring the water balance." But the lens "needs a master" and only an "enlightened one" can create it. "If you have been virtuous, then legend says that the lens will stare you in the eye." There really isn't a way in this game to demonstrate virtue, which is why it was a good thing that, following the conversation, a lens just magically appeared on the ground next to Krindell. That was a pretty lame plot development. I suspect Dr. Dungeon originally had a more lengthy side quest in mind for acquiring the lens. Walking up the river, I encountered a generator at the top. When I tried to "use," it told me to enter the "activation sequence." 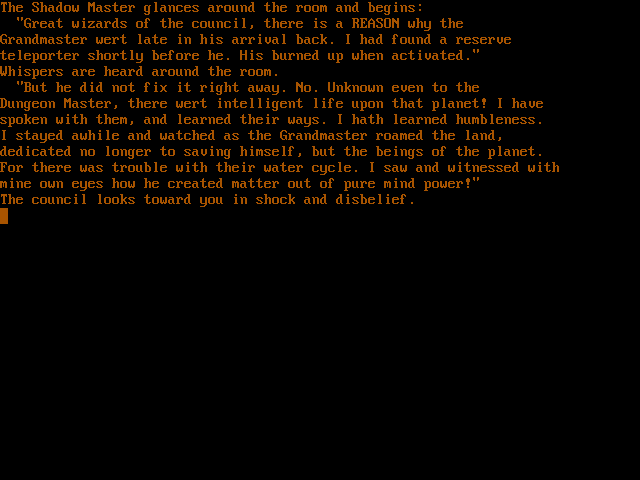 I had no notes for anything like that, so I spent some time going around asking NPCs about it. Krindell still acted as if I hadn't already gotten the lens, and the Shadow Master was still stuck on HOTEYE. After about an hour of futile wandering, I inspected the game's code and found that the answer was "1175." Apparently, it's found on one of the signs scattered throughout the game, which it turns out you have to "use" to read; "looking" at them just tells you that they're signs. Entering the code brought about the long endgame. 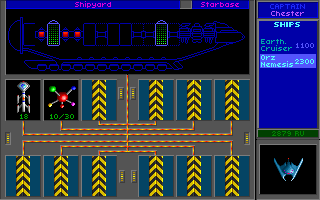 First, a computer display lit up on the generator, an automated mechanism engaged, and I had to re-enter the code. "Intergalactic transmission incoming," it then said, and the face of an alien popped up. Greetings, Earthling. Millions of years ago, our race had already developed space travel. We grew in knowledge and stature. We became as gods. We started with virtues similar to thine own. The planet thou hast seen was an experiment in genetics--the creation of life from inanimate matter. We do this because we respect all life, from the smallest microbe to the largest whale. Our policy is not to intervene once we have created a planet and brought life forth from it. The natural way of things must be allowed its course. Then YOU came. Forgive our bluntness, but we've never seen such a primitive being display such compassion. You saved an entire world from certain death. You persevered for months. When the teleporter failed, you turned attention away from yourself and towards the planet's need. The galaxies themselves sing your praise! I felt that was laying it on a little thick, particularly since I didn't bother to help the planet until it appeared that I was stuck there. Anyway, the aliens somehow transported me off-planet, and I was able to witness a little graphics show by which "the red and brown planet turned blue with water and green with grass again!" Then, somehow I was transported home to the Wizards' Guild. The Dungeon Master began speaking and announced the end to the "contest . 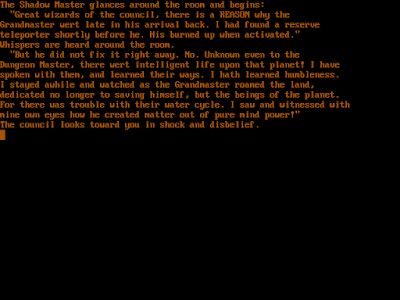 . . between the two top adventurers in the world," namely the Shadow Master--that's apparently his actual name--and me. 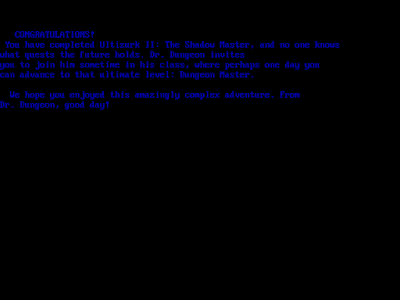 This retcons the end of Ultizurk I a bit, where the Shadow Master kidnapped me and I didn't voluntarily enter a contest. The Shadow Master was named the new Guild Master given that he returned first. 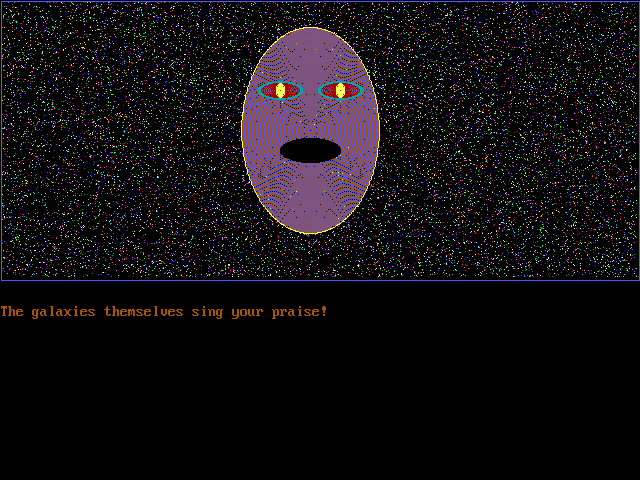 But the Shadow Master got up and made a speech in which he recounted my adventures, said that I had somehow "created matter out of pure mind power!," and praised my selfless rescue of the Arcturians. At his recommendation the Council unanimously made me the Guild Master, and the Shadow Master went off to take over the Thieves' Guild, where he "forgot all about his new-found humbleness." 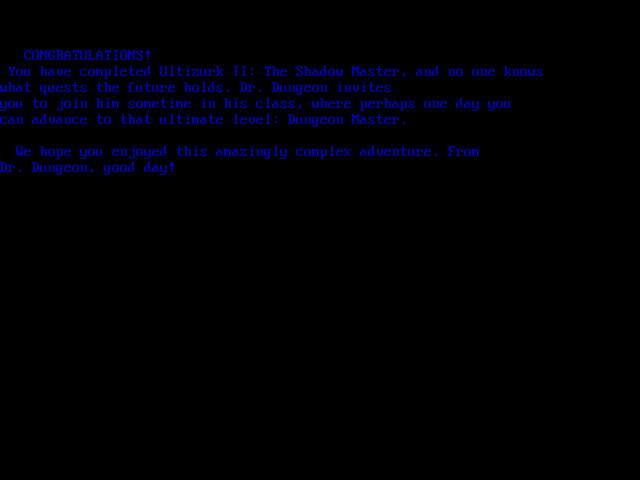 This conclusion slightly undermines one of my complaints, that the game, despite its subtitle, isn't really about the Shadow Master. But only slightly. 1 point for character creation and development. There's no creation, and development is a matter of getting extra maximum hit points at weird intervals. I seemed to hit the level cap (Level 7) awfully early in the game. 3 points for NPC interaction. 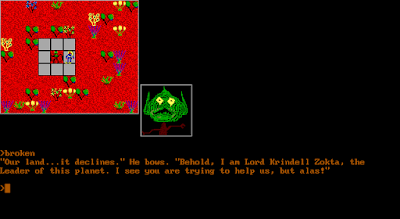 No game that adopts a keyword dialogue system is entirely bad, but there aren't very many NPCs, and the interaction lacks the complexity of the Ultima titles. 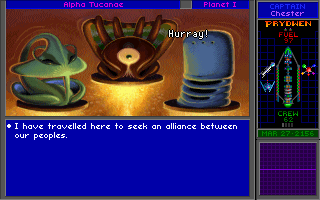 The bland Arcturians almost made me think fondly of the NPC in Ultizurk I who called me "granmassa" and wanted a potion of healing for her "po' lil chile." The Shadow Master's characterization was, I admit, a bit unexpected. 2 points for encounters and foes. It gets that for the a few good puzzles. The various enemies roaming around the map are just icons with nothing of interest about them. 1 point for magic and combat. There's no magic system (odd given that the character is a wizard), and the combat system consists of selecting "attack" and specifying the foe. 2 points for equipment. It gets both those points for the somewhat-interesting herb system. I never found any weapons other than the starting club and sling. There's no armor or usable items. This is another area in which Ultizurk I was better. Loot areas like this one in Syrtis Major Planum don't offer anything but sling stones and food. 2 points for graphics, sound, and interface. There are times that the graphics hold up, and some of the commands work well, but as a whole the interface is clunky, the screen makes poor use of its real estate, and the sounds are harsh and offensive to the ears. 2 points for gameplay, mostly for a balanced level of difficulty. None of the other things that I look for--nonlinearity, replayability, and a proper length for its content--are present in the game. That gives us a final score of 17, a bit lower than I ranked Ultizurk I. But Robert Deutsch is growing as a developer, and I find myself looking forward to Ultizurk III (1993; a two-part game) which, judging by screenshots, at least fixes the screen composition problem. We'll also have The Great Ultizurkian Underland (1993), Wraith (1995) and Madman (1996) to enjoy. Although I've rated Ultizurk II a bit miserably, when you read comments by Dr. Dungeon like this one in an RPG Codex thread, you can't help but root for the guy. If loving RPG development is wrong, he just doesn't want to be right.